I’ve seen this illusion b4…. 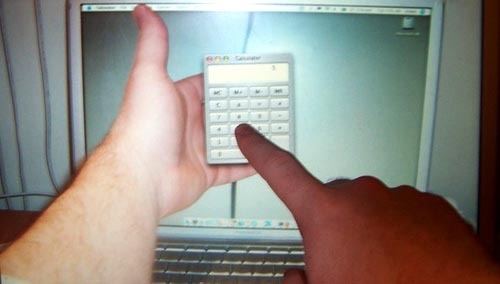 the calculator and the fingers were taken in a photograph and placed on the computer as wallpaper. Then the 2 hands were taken in the picture with the computer wallpaper there too. BUT the fingers of the guys hand was covered…. SMART HUH! Your dragons are beautiful – I make them at work and all my friends really like them too. Thankyou very much. Love tony. HOW THE HELL DID HE GET HIS THUMB OUT OF THE DESKTOP THEN? Thats really easy, take a pic of your left hand in front of your computer pretending to hold something. Then set that as your desktop, open calculator over the top then take another photo of you pointing to the desktop. thats how the thumb is going above the screen – its a photo of the screen! I can see it was photshopped, tis impossible to do the whole thing by illusion, see how his laft arm extaends out of the screen area? Well, tell me how a desktop can do that? If you just took a pic of his hand in front of the screen, his arm would get cut off at the edges of the screen, the only way to this is to photoshop his arm in where the screen ends. Everybody has it soooo wrong, because in the first picture his thumb sticks out of the desktop, so he can’t have set his hand as the background image! And if that’s the case, where did the rest of his arm come from? You guys are looking way too far into this… he probably just took a picture of his hand out like its holding something and pointed with the other hand and then took a screenshot of the calculator and added it as a new layer in photoshop and dragged the layer of his hand underneath the calculator layer…. fools. To Tony Walmsley: what duz ur comment have anything to do with anything? jesus lads – real easy. have a photo taken of your laptop with the calculator on it, then take another photo of your hands as if positioned over the calculator. in photoshop layers just rub away the fingers, hand… to reveal the calculator. probably only take a couple of layers and then merge them into one pic. anonEmouse and Emmy are right. It’s not that complicated. And it was already said at the beginning that it was NOT photoshopped. cool, i did one just like that! Its simple. They printed out a calculator, taped it to their hand, and held it in front of the computer. Jeez. you do realise im 9 and figured that it was the desktop with the picture of the hand attached. the whole picture is the computer desktop. he took a picture of his hand in front of the computer screen (and everything around it) making it look like his arm is coming out of the screen. he set it as his backround then dragged a calculator on his hand. then he took a picture of his right hand pointing at the calculator. there was no photoshop involved. the whole picture is his desktop. The very first comment, as well as several others throughout tell exactly how it was done (some in more detail than others). Why is it that so many people have such a narrow point of view? All you folks want to do is pretend you are smarter than you are (“oh it’s just photoshop blah blah blah…”). Just take your time and read, and understand. People like you go through life without seeing the world for what it really is! This is the easiest ting in the world to do. 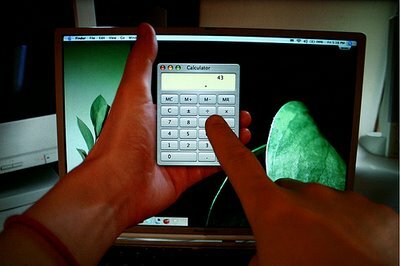 open calculator and place the window in front of the hand, point your hand at one of the buttons and take another photo. He’s holding a picture of a calculator – because it’s at an angle on the second picture more than the first. It works like this……just go to your TV (preferably a CRT) and close one eye. Put your hand in front of the TV screen and move backwards and forwards. With one eye your brain cannot detect the depth. A camera has only one eye! Hence taking a picture makes it look like the hand etc is IN the screen. The rest of the arm etc aren’t in front of the screen at all so aren’t subject to the same illusion. Wow fools The whole pic is the desktop DON’T YOU CLOSED MINDED PEOPLE GET IT. In the second pic the caculator looks cricked but it isn’t the only thing is that the picture of the computer wit the hand infront of it is crooked. Listen to the first coment and his folowers THEY ARE RIGHT! It was a while ago that I did it, but I believe that correctly describes the process. OH MY GOSH!!! I so have to try this! Haha, very powerful illusion. The trick is this: you are NOT seeing the “real” laptop!!! The left hand, room background, laptop, etc are all one photo that is used as the BACKGROUND IMAGE of a computer – a computer that we cannot see, because the photo is too close. Then the calculator is pulled up as an app on that computer, and positioned to look as if it is in the “hand” of the background image. Finally, the right hand (real) is pointed at this entire screen image (remember, the entire frame is one screen! We cannot see the actual laptop!) and the photo is taken. Magical. PPLZZ!!!!! j00 are all lyk soooo00o0o0o0o wrong..can not you SEEE>!?!?/1/??? HE PUT HIS HAND INSIDE THE MONITOR>!>>!>!>!<…..G0sh.. >_> it's lyk obvisly imposibl to mak that picher wiff photoshop….or illooshun..he's lyk magic j00 no? 2- put left hand in front of computer like you are holding something, take pic, and put it on your screen. 3- drag calculator in front of left hand (picture on computer), point with right hand, take picture. 4- crop the pic so that you can’t see the edge of the computer screen. OMG so much work, when u could have easily done it in photoshop, wat lame lifes they have. Ok you guys, you seriously aren’t seeing it correctly… You take a picture with your hand in front of your ocmputer screen so your thumb is over the top of the screen. then you set that as your desctop and it will look like your computer inside of your computer with a hand in front. Then you open calculator and place it on the hand so it looks like the hand is holding it. Then you take a picture of your desktop of just the computer your hand and the calculator and it will look like you are holding the calculator infront of it. It’s simple.. The dude just lost 4 fingers and it holding them right against his calculator! It’s not Photoshopped or a Background. It’s a real Calcyulator. You have a Windows version of it and a Mac one. Search google: real Windows Mac calculator, and you’ll find ! How on earth is he able to… you know… be on Mac. Seriously, i would have died already. Okay well I think I’ve got it. I’ve seen a bunch of explanations and the ones that seem to have no flaws are those that explain it like this. You’ve got a laptop. You take a picture with a normal digital camera of your hand pretending to hold something; this is how the hand can extend outside of the edge of the computer. It is a picture of your hand, the laptop, and a little bit of the surrounding area. Now you take this picture and put it on the desktop of a different computer. This would mean the edge of the laptop shown in the pictures above is only the image of the edge of the original laptop. Now bring up calculator, and move it so it looks like you’re holding it, and point at the screen. Take a picture with a normal camera, and crop out the sides of the second computer, so you can’t tell that two computers were used. aww i wish you could really do that!!!!! one’s his right hand, one’s his foot. Printed out a picture of the calculator and then held it up to the screen…? This would have been a lot harder to figure out if the second image was not included. The first image is good because the calculator is squared up with the screen and the contrast levels are even. The second image is not so good and IMHO gives away the secret. First, it shows the calculator rotated counterclockwise a few degrees. This made it very clear the calculator was very likely just a printout of a calculator held in the left hand. Second, the right hand of the second image is darker than the left hand which leads me to believe it’s a composite. I think the calculator and left hand were photographed with the right hand holding the camera; the image is displayed on the computer, and then the right hand points at the calculator while the left hand takes the final photograph.